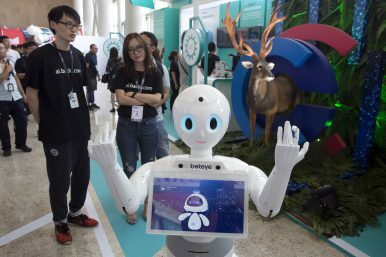 In this July 4, 2018, photo, a robot from Chinese search company Baidu welcomes visitors to a developer event in Beijing, China. The three factors underlying China’s transformation into a rising technology powerhouse. Statistical data shows that, starting from the second half of the 2000s, China has been second only to the United States in research and development (R&D) by many measures, such as R&D spending as a share of GDP and number of academic research papers. In the latter case, China surpassed the United States in 2016. However, the numbers tell a drastically different story when looking at certain measures of the economic value of R&D activities. According to data from the World Bank, the payments China made for intellectual property in 2015 were 22 times more than those it received from the rest of the world. What the rest of the world paid to China for intellectual property use was less than 1 percent of the amount paid to the United States. Productivity analysis also indicates a low return for China’s excessive R&D activities, as its Total Factor Productivity (TFP) follows a weaker track, even compared to other developing economies such as India. China’s labor productivity growth remains the highest around the world, but it has been slowing down in the recent decade, despite the rising technological capacities. This puzzling picture may remind observers of how the Soviet Union excelled in science and technology in the 1970s and ‘80s, but mostly focused on military and space technologies, which translated very minimally into gains in productivity and economic performance. That mismatch eventually led to the collapse of the regime; such a model is certainly not sustainable. Yet despite worries that China may be following a similar path in this regard, the Chinese example is in fact quite different. Three takeaways from the Chinese case show that technological progress can be engineered, and thus accelerated, to a certain extent. Examples not only from the Soviet Union model, but also the Manhattan Project, the Apollo Project, and the Star Wars Project are proof that, to some extent, innovations or technological progress can be planned, provided that there is firm determination from stakeholders and sufficient resources. China is currently running many Apollo-like projects, such as the 863 program, the 973 program, and the 13th five-year plan. Most of these project are targeted at catching up in strategic and selected industries, such as those identified in the “Made-in-China 2025” strategy. These government initiatives are matched with the unprecedented amount of fiscal and financial resources made available in the post-2008 period. The Chinese version of Quantitative Easing (QE) generated massive funds to be channeled toward expanding R&D; hiring overseas Chinese experts as well as foreign experts (especially in strategic sectors such as advanced material, electronic chips and computing, aviation, bio-tech, and A.I. and robotics), importing high-tech capital goods, acquiring foreign technological patents and licenses, and merging with or buying out foreign high-tech companies, especially by state-owned Chinese corporations. This driving force is complemented by the other two pieces of China’s technological puzzle. Technological innovation is intrinsically about capturing a new phenomenon through the identification or the creation of new combinations of component technologies. Improvements in the structure, design, or method of an existing technology that deliver a better performance are called incremental innovations. Thanks to China’s status as a world factory, the supply chains of various industries, consisting of thousands of component technology suppliers, are now clustered in the country. R&D activities based in China could thus be more effective in identifying or creating new combinations, as evidenced by the many global industrial giants setting up R&D centers in the country. In addition, in searching for the best supply chain capability to commercialize innovations, high-tech industries increasingly look to China for manufacturing solutions, a kind of complementary innovation. Apple’s products are typical examples. China’s internal market, now with 1.4 billion consumers and a per capita income of $8,000+ in nominal U.S. dollars and $15,000+ in PPP U.S. dollars, is also a blessing to innovation in many ways. The huge market size promises sufficient return to cover the costs of either acquiring foreign technology or undertaking a cumulative learning process to catch up with frontier foreign technologies. The potential size of return also enables Chinese industries to afford the pursit of very expensive technologies, such as CPU chips, nuclear energy, and aviation and space technologies. In some cases, market size is also the key for unlocking the “learning curve” effect, as in the cases of the Chinese solar and electric vehicle industries. Moreover, technologies by themselves do not recognize physical borders. A market as large as China’s has attracted not only many of the best technologies, but also many of the best scientific and technological talents globally. There’s not a small number of Americans, Japanese, Russians, and Ukrainians currently working in China, developing advanced electronic chips, aviation and space equipment, advanced ICT, and so on. Lesson 3: Free Thought Is Not a Necessity. Capacity Building Is. The Chinese tradition of emphasizing education is also crucially important for its technological rise. Besides the government’s spending 20 percent of its budget on education, Chinese households also invest heavily, reaching levels equivalent to 50 percent of the government’s education budget. Globally, China has the highest number of students studying overseas and the ratio of these students returning to China has been increasing. All these measures endow China with not only an educated and disciplined labor force to work with newly introduced technologies, but also with the R&D capability to learn and eventually innovate on top of existing tech. Some argue that China’s strict control on its residents’ freedom of speech and censorship on flows of information – most notable in the Great Firewall — will block the exchange of ideas and thus stifle innovation. However, China’s recent phenomenal achievements in science and technology show exactly the contrary. For innovation, the biggest need is the freedom to access and communicate well-defined scientific and technological information, knowledge, and ideas in order to inspire innovation and technological progresses. Beijing has never blocked these resources, such as ScienceDirect and IEEE Xplore. In fact, the Chinese government actually provides generous funding for Chinese researchers to interact and collaborate with their global counterparts. It is these activities and means of communicating professional knowledge that really matter. The exponential growth of Chinese researchers’ publications in international academic journals and registration of patents are firm evidence that China’s strategy has worked well so far. In short, China’s rise in technological capability is taking a path that is drastically different not only from the Soviet Union model, but also the newly industrialized Asian economies. It is driven by a mix of the strong will of the state, which supplies both guidance (in the form of policies) and resources, and economic forces. As such, China’s technological capabilities have been given incredible momentum. This is reshaping the global economic structure from at least two aspects. First, China has now-mature capabilities in medium-level technology, such as machinery, infrastructure construction, modern logistics, electronics, and renewable energy equipment. These technologies are exactly what the developing world needs to quickly improve economic and social wellbeing. Second, as China keeps moving from medium technological capability to high-tech capability, many of today’s so-called high-tech industries will become commoditized at an accelerated speed. In the past 10 years, we have witnessed how China commoditized computers, smartphones, modern metro subways, and even high-speed rail. Low-income countries and social groups benefited the most. In the future, some of the technologies enjoyed today by advanced countries — such as smart and clean energy systems, autonomous driving cars, new energy vehicles, automation and robotics, advanced medical equipment and medicines and so on — will become increasingly more affordable to developing countries, a process that will be largely driven by China. This development is one of the key drivers behind the Belt and Road Initiative. However, none of this implies that China will surely become a global leader in technology and innovation, especially to the extent that it can replace today’s advanced economies. China’s achievements in the recent decade are mostly limited to “catching up” in targeted fields. Most of the original innovations that Chinese industries are currently capable of are “incremental” rather than “disruptive” breakthroughs. Thus, there’s a long way to go for China to transform from a fast learner to a true innovator in major high-tech fields. Yanfei Li is an Energy Economist Policy Fellow at the Economic Research Institute for ASEAN and East Asia. China’s AI Agenda AdvancesChina's Artificial Intelligence RevolutionChina’s Evolving Economic StatecraftLiu Yadong, Mr. Science, and China’s Shaky ModernityChina’s Artificial Intelligence Revolution: a Sputnik Moment for the West?